Hello lovies!! It's Tracie Claiborne here to talk to you about something that's my favorite. I love that this month is all about favorites because favorites are my favorite! For reals. When I heard the topic for this month, I knew it would be hard for me to decide what story I wanted to tell because the list is endless! I could document my favorite foods, television shows, movies, childhood memories, people, places, scrapbooking products....the list goes on and on! I decided to focus on my favorite music because music makes me so happy. See how great these little images came out? I printed the collage 5.5" x 5.5". So what story about your favorites do you want to tell? Today would be a great day to tell it! Hello everyone it's Cari here I'm today I'm going to show you my two favorite techniques when it comes to scrapbooking: grids and layers. I've been into scrapbook for a while now and when I first started I really had a bad time trying to figure out what I like and how I wanted to be my scrapbooks. What it helped me a lot was to look into galleries and to listen to other people experiences, so here I'm to share with you why this two techniques work for me. I'm going to start with grids, who doesn't love them? When I start a grid layout is a win/win, I know I'm going to love it. For me is as simple as placing my photo and start filling de rest of the space with paper and embellishments, since I started doing this I start loving most of my layouts. For this layout I decided to make a rectangle, so I placed my photo over my page and then filled all the space under my photo. What I also love about this technique is that you use only tiny pieces of paper so It seems it last you forever. For example this two squares of paper are from Studio Calico Sundrifter and I have it since 2013! I'll go ahead with the layers now. I don't like my layout to be flat -and this is something about tastes, it is completely fine if you like it!- so with layers I can make my photo pop. I don't normally add layers everywhere nor on everything, I only place some layers behind of my photo, because that it's what I really want to pop in my layout. Once I'm done with my layout I always sew with my machine a little bit, this has two good thing: it looks pretty and you secure that your papers will never fall down! Happy New Year's Eve, everyone and thanks for stopping by the Write, Click, Scrapbook blog today. New Year's Eve is a time to reflect on the amazing year you've had, and look forward to a new year to come. Scrapbooking is a great way to document those special moments, and I wanted to share with you some layouts that do just that. First up, some of our design team members shared some of their pages they created to reflect . Aliza created this page about some of her favorite moments in 2012. I love how she used a family picture and highlighted all her favorite moments. Diane sent this fabulous layout. I love how Diane did her journaling month by month. Next up, Kate sent this layout showcasing her favorite moments in 2012. She did a fabulous job showcasing monthly favorites as well. Amy created this layout about some fabulous moments in her son's life from the past year. Jennifer created this amazng page with so many favorite pictures from her year. I am in awe of how many pictures she included on this page. I love the page she created for 2012 as well. Jenny created a page highlighting some of her favorite photos she took during the year. Lisa created this page to share some favorite moments from 2010. New Year's Eve is also a time to start looking forward to the brand new year to come. Last year, I created this mini album for my family to jot down their resolutions for the following year. For a few years, I have particiapted in Ali Edward's One Little Word and picked a word to focus on for the year to come. Here is my word and layout for this year. I hope that you enjoy a safe and fun New Year's Eve, and thanks for stopping by the WCS blog. Happy New Year! First things first: that is how Emma sees me through the lens of a camera. Yep, photo courtesy of my five-year-old while waiting in the doctor's office. And with that, hello and welcome to Saturday and what I'm doing right now. Well, not right now this very second, that would be watching the news and drinking a Dr Pepper. But rather what I'm doing, what I'm loving, and what's on my wish-I-had list. Pinterest. Have you tried it? Love it. It's a great way to keep track of your scrapbook inspiration as well as other crafts, home decor, fashion and more. Now that I have a boy, I need to start acquiring scrapbook supplies that aren't pink, purple and sparkly. Enter Crate Paper's Toy Box line. My favorite? The chipboard embellishments. I need them. For inspiration, I'm stalking reading Keisha Campbell's blog, A Bit East-coast. I love her photo placement, mixture of patterned paper and use of embellishments. I think I'm drawn to her style because it is so opposite of mine. I'm scraplifting myself. Which I realize seems a bit of a contradiction to my post yesterday about stepping out of your comfort zone. But I was recently looking through my girls' albums and saw some pages I really loved. So I pulled them out and am using them for inspiration. That layout wraps up my week. Thanks for stopping by. I'd love to know what's on your Right Now list, leave a comment and I'll be sure to check it out. Bo Bunny’s Whoo-ligans. How cute is that name for Halloween papers? I really liked the cute patterns but what appealed to me even more is that only one side was theme-related – the B sides had more geometric patterns and could be used for any theme. I also really liked that they introduced blue into a Halloween color palette. Such a fun line. Bella Blvd’s One Fall Day. Loved the color palette here too – I especially love the teal. As in my previous pick – I could see myself using the geometric patterned b-sides a lot. Crate Paper: The Restoration line was very pretty, subtle patterns –beautiful stuff and the booth layouts were stunning. Snow Day was cute, cute, cute and my favorite Christmassy line at the show. But wait, there’s more! I have to also mention American Crafts City Park and the KI memories Sew Happy papers. Maybe I should have gone with a top 10 list! I didn't even get to mention some of the cool tools that I saw, in particular WeR Memory Keepers Sew Easy. Even though it was a small show there was plenty there to keep me interested! The Jenni Bowlin mini school alphas: Give me a Jenni Bowlin alpha and I'm happy. Give me a mini Jenni Bowlin alpha and I'm giddy. Give me a whole bunch, and well, I'm over the moon. Talking to Jenni's husband Jared, he said he wasn't sure why they didn't do them earlier, the larger ones had been such a huge success. I can only say I'm just glad they did them. KI Pockets and Sew-Cute Calendars: KI has returned to it's roots and I am thrilled. I started scrapping when they released their Grateful line. I loved the Grateful Stripe. When it was discontinued I bought the last 10 sheets my on-line store had. I still have 6 or 7 :) I loved KI. Then things changed up a bit and I struggled to love. But this new release, Over the Rainbow is awesome. I love it. But I really love the cute new pockets and the Sew-Cute calendar paper is fabulous. Best part? The other side looks just like the calendar side, sans calendar. VERY good idea. These MM flowers are just happy. You love punches? You're in trouble. EK Success has put out a bunch of new ones, the punched areas are about an inch in size, so dang cool. I love the scallop w/ the circle. My overflowing punch basket is in trouble. My favorite paper of the entire show? Well it would be this one from the BG Wander line. It's called Metropolis and it's very whimsical. BG really hit it out of the park with the Wander line, I love some of the Jovial pieces as well. Go BG! and my final pick ( I know, I went over...) but how cute are these pink felt flowers from Pebbles? Like Paula said, the show was small, but over all the manufacturers really gave us some great things to drool over. Every time I go to a show I think they won't top themselves. 9 times out of 10, they do. We hoped you enjoyed our reports from CHA. We're off to catch up on some sleep! My random week ends with favorites. We all have our favorites - food, shows, book, all-things-scrapbook-related, Dr Pepper and Bon Jovi. And that's what today's post is about. All my current favorite scrapbook goodness. Here we go! I'm sure you all have your go-to scrapbookers when looking for inspiration. You know the ones, whose layouts are like eye candy. Two of mine are Susan Weinroth and Stephanie Howell. Added bonus - she quilts. Fantastic quilts. And not only are the front of the quilts beautiful, the backs super fun, too. I need to learn to quilt. A couple other favorites are this ruffle card and this pillow. I also really need to sew more. For more of Susan's work, check out her blog. Two things Stephanie does on her pages I love? Her handwriting and the way she can just sprinkle embellishments (love the butterflies) over her page and it just flows and looks so good. I tried it once. It didn't turn out nearly as cute. You can see more of Stephanie's projects on her blog. For Mother's Day, I upgraded from Photoshop Elements 4, to Photoshop Elements 8. Which means I can now use Actions, and that is very exciting. Well, at least to me, it is. I immediately downloaded Pioneer Woman's Actions for Elements. And I immediately had a favorite - the Seventies action. Which I used on this photo of Mackenzie. And then this one, of Emma and her friend Bree. Seriously fun, and it makes me want to make every photo look like it came from the seventies. Have you seen the new Jillibean Soup line, Summer Squash Soup? Oh how I want it. Love the colors and patterns - I already have pictures in mind to scrap with it. I tend to use the same colors when I scrap - bright shades of blue, green, yellow and pink. Kind of like these dresses I found at Target for Emma and Mackenzie. I need scrapbook paper that looks just like that. In fact, how about an entire summer line built around it? Yes, please! I love how the colors just pop off the page, and the stacked Polaroids are so fun. Because who doesn't love Target? I love that Sherry turned the tape that gives toilet paper a handle in to a scrapbook accent. Hee hee. Beautiful page. Love how the photos are linked together. And with that, my week is over. Thanks so much for stopping by this week. I've got one last question for you before I go - What are your favorites? Share some blogs, tools, Actions, layouts, products and more - let us know what you are currently loving in this oh-so-addicting hobby of ours. My husband is the electrician at a large resort. When he arrives at work and opens his locker, essentially all of the tools he will possibly need for the day are on the shelves in front of him. Some of those tools are important enough that he carries them on his person. But he doesn't do this randomly. He keeps his essential tools organized in four pockets in the exact same order every day. On particularly hectic days, if he accidentally puts a tool away in the "wrong" pocket, he's very likely to spend some time backtracking to look for it. Within that group of important tools, there are a few which he would replace with the exact same brand and model should they break or go missing. No shopping for the best bargain or trying something new. As a scrapbooker, I can relate to my husband in many ways. Within my creative space are all the tools and supplies I need in order to scrapbook, but there are some that I must keep out in the open and near to me because I will reach for them often. And within that group are those items to which I am brand-loyal. Making the most of basic tools starts with discovering which ones are the best fit for you, making sure you always have those items on hand, and storing them in a way that allows you to use them with ease. I asked the Write. Click. Scrapbook gals What are the 3-5 tools you cannot live without? and How do you keep them close at hand? As I compiled their responses, I found many areas of overlap as well as plenty of uniqueness. Some other tools worth mentioning include x-acto knife, paper piercer, adhesive eraser, bone folder, sewing machine, needle & floss, Undu, cutting mat, sandpaper, and distressing tools. Three people consider white cardstock to be a necessary tool, since it's so foundational! Elizabeth can't scrap without her iPod, Sara puts Adobe Photoshop Lightroom to good use as well as a sketch journal, and Candice is always pulling out paper with lines for journaling. The most unique responses? Tina uses tweezers from a suture removal kit for removing stickers from their backing and for placing those stickers onto layouts, as well as for fishing brads out of their jar. Clever. And Elizabeth uses an awl she stole from her husband ten years ago (her words!) for poking holes, because it's sharp and doesn't drag. USA Jody has a huge 4' x 6' table in the middle of her studio where everything she needs is basically at arm's length. Beth keeps all of her essentials in a tray in the middle of her work table. Others keep their tools in baskets or drawers near their workspace. Aussie Jody has a Making Memories Carousel Organizer for all her tools, but at the moment her favorite items are in a Cropper Hopper Photo Case because she's found it easier to transport to craft events away from home. Tina up-cycled a couple of soup cans by covering them with cute October Afternoon patterned paper and filling them with necessities. Since I'm such a vintage nut, I enjoy using this old tool caddy for storing the things I use the most. I hope this post has motivated you to decide on and centralize your favorite tools and organize them in such a way that you never have to think about where they are or work to get to them. Maybe you've even found a new tool to try out. I know I have! See you back here tomorrow to wrap up the week with Y! Hello again from Anaheim! Today is day three and our last day here. We've had a very busy and productive three days - talking with manufacturers and seeing many friends. It's always a very full day and we're exhausted, but also very satisfied that we've done what we came to do. We loved these birds cut from patterned paper in the EK Success booth. We've noticed that so many booths have displayed projects and ideas that are do-able and cute and very Etsy-esque. And they are releasing a new line of decorating paper sheets for lining drawers or tea trays or shelves. Very vintage-y and a great way to add color to a room. Japanese tapes in a variety of colors, patterns and widths. Very delish. ...Marnie won a Slice! Yeah Marnie! Then we saw this adorable Advent pennant project at the Maya Road booth and some adorable pennant stamps. Have we mentioned how much we're loving all the pennant and garland products and projects we've seen at this show? So cute. We've had been such a great time here at the show and Marnie, Elizabeth and I have thoroughly enjoyed our time together. We've got a lot to do in the next several months and we're so excited about what's to come. Here's wishing them both safe travels tomorrow as they head back to their families and catch up on their sleep. Stay tuned tomorrow for Giveaway Day and for a CHA wrap-up from Elizabeth on Friday. As is always the case at CHA, there is so. much. to. see. This show is in so many ways so much better than the summer show in Orlando last year - the mood of the show, the number of exhibitors and attendees. There's a kinder, gentler spirit of this show and this was so well represented in the first booth we visited today. This line is so adorable, just like Lizzy herself. We can't wait to get our hands one some of this! And did you know that AC and Pebbles have merged? We loved these 4 x 6 journaling cards for our photo album scrapbooking projects. We loved AC's new inks! And their new adhesive line reportedly doesn't reported skip, slip or trip. And it's called "This to That" which makes us want to buy some even more. We all love the pennant design elements we've seen on so many projects and decorating so many booths. Definitely a new trend out there in Scrapland. Another great looking new release from October Afternoon! YAY! Making Memories has a new line of jewelry products, something we also saw at Scarlet Lime. We loved Little Yellow Bicycle's new releases and this fun Lucky Me line. Our booth tour guide told us the owner was inspired to design this line because she's always finding four leaf clovers. Lucky indeed! 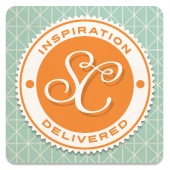 Did you know that AdornIt Carolee's Creations does more than just scrapbooking? Here's just a taste of what they've got up their sleeves - watch for more! Co'Ordinations paper is a color-core textured paper line that has been embossed to coordinate with the patterns in Jenni's papers. Just sand the surface to reveal the layer of color underneath! Several other manufacturers have done the same. We love all these new ways different companies are partnering with each other. Elizabeth, Aly, Marnie, Angie, Wendy and me. "Nearly five years ago, when Renee wrote the first Digital Designs for Scrapbooking, computers were not yet an essential tool for mainstream scrapbooking. As the popularity of digital scrapbooking has grown, so has the need for easy-to-follow instructions. That's why she developed this workshop. Renee will personally lead you through the fun, fast and easy lessons designed specifically for the beginning digital scrapbooker or crafter. Using Adobe Photoshop Elements 6, 7 or 8 and the digital kits and templates provided, you'll be whipping out digital scrapbook pages in no time. The curriculum is based on weekly lessons including video, pdf and other learning aids. The workshop is designed to gradually introduce new topics and skills, allowing you to master one skill set before moving on to the next. At the end, you'll have a comprehensive set of skills you can use to create your own digital pages." Leave a comment for a chance to win! And thanks to Renee for such a nice surprise. Even more eye candy tomorrow!